Secretary General of the Organization for Security and Co-operation in Europe (OSCE). 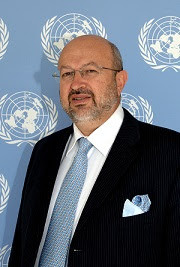 Ambassador Lamberto Zannier took up the post of OSCE Secretary General on 1 July 2011. Zannier is an Italian career diplomat. From June 2008 to June 2011 he was UN Special Representative for Kosovo and Head of the United Nations Interim Administration Mission in Kosovo (UNMIK). The OSCE Academy in Bishkek cordially invites you to the public lecture by Secretary General of the Organization for Security and Co-operation in Europe (OSCE). The Organization for Security and Co-operation in Europe is the world’s largest intergovernmental organization. The OSCE has a comprehensive approach to security that encompasses politico-military, economic and environmental, and human aspects. It therefore addresses a wide range of security-related concerns, including arms control, confidence- and security-building measures, human rights, national minorities, democratization, policing strategies, counter-terrorism and economic and environmental activities. All 57 participating States enjoy equal status, and decisions are taken by consensus on a politically, but not legally binding basis.